While we were busy tweeting and trying to promote cycling on twitter Equal Streets seemed to have caught the trend on Twitter home. Even Mumbaikar’s seemed to be tweeting about it and we wondered what’s so special about it that we weren’t aware. We clicked on the #EqualStreets which was trending and were surprised to know Equal streets provides better and safer walking and cycling infrastructure for the people. This initiative was formed by several NGOs, cycling groups and residential welfare associations who have come together to introduce EQUAL STREETS – a new, innovative concept to correct the fundamental imbalance in our city’s urban planning priorities. We scanned through their new website and were really happy and immediately decided to interview them and let everyone know what this moment had in store for Mumbai city. We got in touch with Sachi Aggarwal (Communications and Marketing Associate EMBARQ India) for the interview as she and other Equal Streets team members Nishant Patel, Rishu Shah and Harish Wahi who have taken out some precious time and answered this interview. By the time you reach halfway through, you will know a lot about Equal Streets which nobody knows. 1. What motivated you to start Equal Streets? Equal streets, just as the name suggests was born out of the necessity to regain equal rights on the streets for all the citizens, irrespective of their mode of transport. The streets today leave no space for citizens to walk, with the pavements being encroached upon and the roads completely unsafe for cyclists with motorized vehicles’ sheer volume ruling them. The traffic-congested roads of Mumbai are in an extreme state of despair. Today it is a rare sight to see a child cycle to school, though less than two decades ago; I would cycle to school, as a preferred mode of transport over the School bus. The current state of road safety has made it impossible for kids to ride and a nightmare for parents to let the kids free on the road. The prominence of this once very important mode of transport has slowly dwindled over the years. Through the equal streets movement, we wish to give the citizens a chance to reclaim their streets, reclaim their rights. 2. What do you aim to achieve out of Equal Streets? We want to make citizens aware of their right to equal space in the city, irrespective of their mode of transport, eventually making it a part of Mumbai’s development plan. We’re hoping to correct the fundamental imbalances in our city’s transport planning priorities by benchmarking the transport facilities in the cities world over and giving people a chance to reclaim their streets, thus improving the walking and cycling infrastructure of the city. 3. How difficult was it to launch Equal Streets? It definitely took hours of planning, months of ground work and sheer team effort convincing the authorities for permissions and explaining to them the vision with which the founders started the initiative. The success of Equal Streets that everyone witnesses today is a result of a solid years work by all the team members and the supporting authorities. 4. Tell us something that not everyone knows about Equal Streets? Equal Streets is a movement for the people, by the people. All the founding members initiated this for the larger interest of the society with no vested interest or profit from the same. Hours of time, energy, resources have been invested purely on a voluntary basis by the team members. All this, just to make it a better place for our generations to come. We expect the citizens to open heartedly volunteer and support us in this cause. 5. What are the roles that different Equal Streets teams play? Planning an event of this stature required teams with varied skill sets and sheer determination. Experts belonging to different disciplines, right from architects, urban designers, transport professionals, event management, outreach and communications, media and journalists to local authorities permission, on-going coordination and lastly the cycling community are all a part of the huge team effort. 6. Does Equal Streets have plans on branching out this initiative to other streets in Mumbai? As a citizens’ movement, our focus is to give more and more people a chance to experience this freedom, even if it’s just for a few hours every Sunday. It’s to give them a chance to cycle and walk freely without having to worry about being run over. The success of Equal Streets has spread rapidly and we have people from all across Mumbai visiting every Sunday. It has been a humbling experience when citizens and organizations have approached us to conduct similar events in their suburb. There is a lot of planning involved, but yes, the idea is definitely to cover as much area of Mumbai as possible to create the awareness and finally make it a permanent part of our daily lives Moving forward. 7. Does Equal Street have plans on branching out this initiative in other cities in India? Mumbai is the 7th city in India after Gurgaon, Navi Mumbai, Bhopal, Ludhiana, New Delhi, Ahmedabad and recently Dwarka and Indore to join this Open Streets initiative. We would love to see every Indian citizen enjoy the freedom and equal rights on the streets. 8. Have you received any support from the government or police? If yes, then how have they been helping? Equal Streets has witnessed and continues to look forward to the active participation and support from government organisations responsible for various functions in Mumbai, such as MCGM and Mumbai Police in the future. These agencies have not just granted permissions to run this event, but these government organisations have been actively participating in the initiative. It is our endeavor to work closely with the government in a positive and constructive manner to develop solutions for permanent change, and to create awareness among the community around important social themes, in line with this initiative. 9. Do Equal Streets have any plans for the future? A lot will unfold as the events grow, but our request to citizens is that we want them to come forward and help us in this movement. 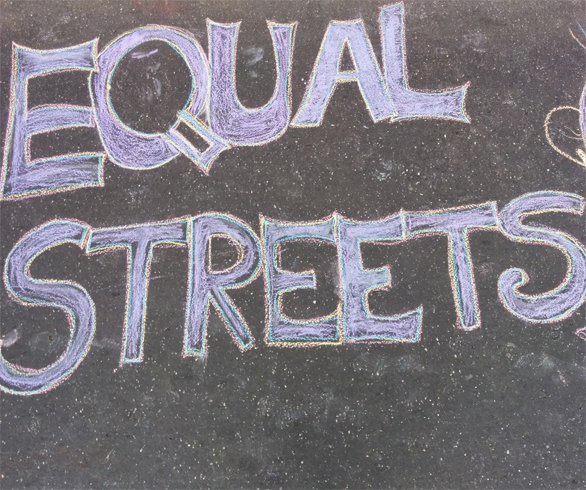 Please join our Facebook page and visit our website to send suggestions on what you would like your Equal Streets initiative to look like and together we will make it possible. 10. Is Equal Streets open to everyone? 11. Do you think this initiative has worked well? Where do you see it going in the next few years? It’s too early to define whether we have been successful or not. But we have definitely been appreciated and that can be judged by the turnout of people every week. We have seen people from all over Mumbai visiting us. One of the mothers who attended Equal Streets, told us about the renewed passion for cycling she recently saw in her son. She also mentioned that, due to lack of space, her son was never this motivated to cycle but that has changed after Equal Streets was launched. A lot is in the pipeline. All I can say right now is that the future is changing bit by bit and don’t miss the chance to be a part of the change. 12. What according to you can a citizen do to help the Equal Streets initiative? 2) Attend Equal Streets, aligning yourselves with the larger objectives of the movement, encourage cycling and walking. 3) Equal Streets should only be accessed through public transport. The purpose of this movement is to address the provision of continuous and well-maintained footpaths and non-motorized transport infrastructure with the vision of making the streets for people, not vehicles.